Quake 4 is a game built on the Doom 3 engine. 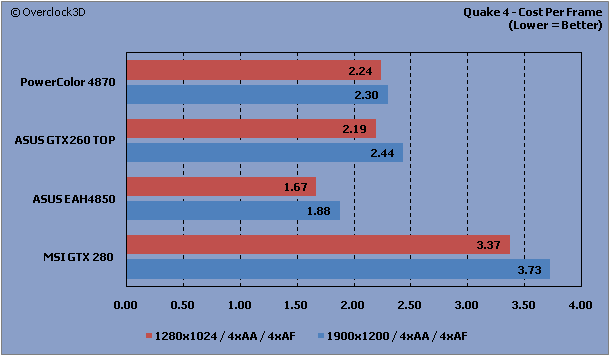 Benchmarking was performed using Quake4Bench and a custom timedemo recording. The benchmark was set to run a total of 5 times, with Quake4Bench automatically calculating an average result at the end of the run. 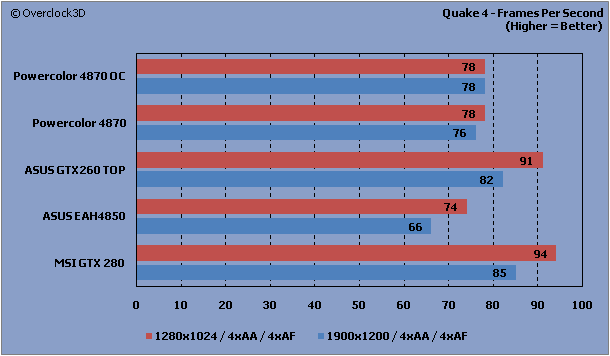 Quake4 produces some very strange results for the HD4870, with the results capping off at 78fps even with the card overclocked. Initially we thought that this may have been some kind of internal frame limiter or rogue vsync setting, but even after a reinstall of Quake 4 the limit was still present. A quick switch over to the GTX260 broke straight through this barrier managing to hit 91fps at 1280x1024 and 82fps at 1900x1200, but obviously this doesn't bode very well for the 4870 in this particular benchmark. 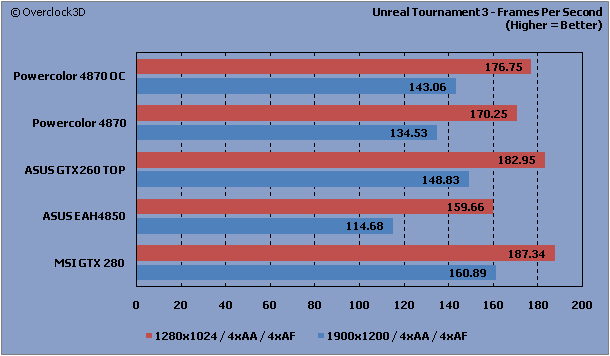 At a resolution of 1280x1024, each of the cards used in the test were able to pass 150fps without breaking too much of a sweat. Once again the leaders of the pack are from the green team, with the GTX260 and GTX280 beating out the HD4870 by between 5-10fps. 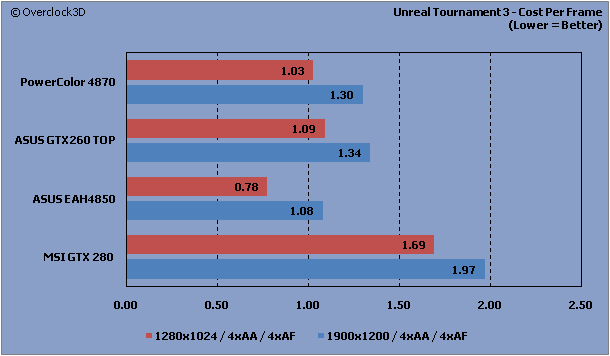 However, the gap between the red and green team widens even further when the resolution is increased to 1900x1200 with a 14fps advantage being had by theGTX260 over the HD4870.